Once upon a time, there was a tower every knight and lady who had a wish visited. Racing another aspirant was the only way for their own wish to come true. The fastest one at descending the Tower would be the winner. 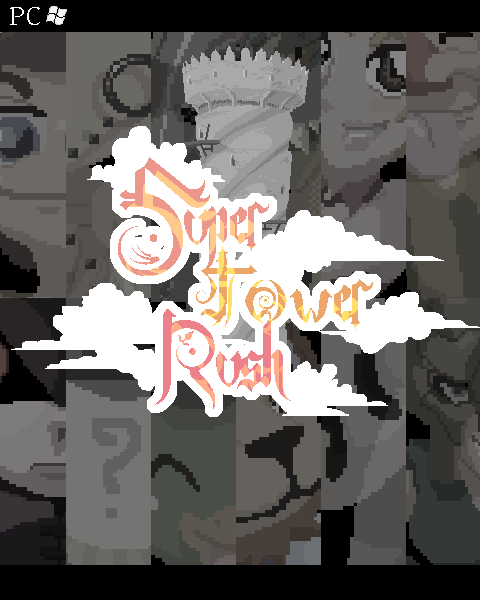 Super Tower Rush intends to bring old values back, such as shared gaming experience face to face, even from the same keyboard, although it includes a system to play online with the community and a single player mode to train and unlock game modes too. The featured game for March 13 - 16 is here! Get it now! 10% of all sales generated by this deal will go to Open Source Ecology. 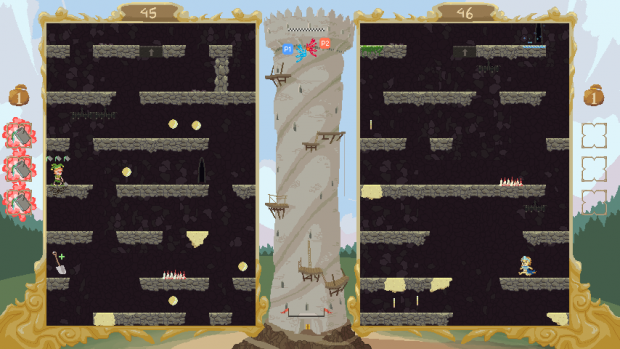 Go head to head with a friend in a race to the bottom of the tower! Use magic spells and abilities to hinder your opponent, and to evade their attacks. Local multiplayer is already supported, and online multiplayer is in the works. Top-notch pixel graphics and frantic arcade action for two! What are you waiting for? "Once upon a time, there was a tower every knight and lady who had a wish visited. Racing another aspirant was the only way for their own wish to come true. The fastest one at descending the Tower would be the winner. Super Tower Rush intends to bring old values back, such as shared gaming experience face to face, even from the same keyboard, although it includes a system to play online with the community and a single player mode to train and unlock game modes too." The original soundtrack of the game! 14 wallpapers based on the game's characters! The top three contributors will receive special rewards! There was a tower every knight and lady who had a wish visited. Racing another aspirant made the wish come true. I know this comment wont even be read, but it's a shame this game was abandoned like it was. I bought it directly from the dev website via paypal years ago but that page has long since been taken down, the link on the Evelend site redirects here and there is no way to download the game or access it anywhere. i liked the game, and i feel little sad that they "abandoned". thats a bummer. I don't know if pledging for their new project is that good when they are always starting new projects and abandon them after a time of development. I first like to see a finished game from the developers. It looks like they've moved on and left this to the dust. Some instances were you can just skip the re-spawn countdown if you keep the movement keypressed while you die (or the removal fo the countdown). "Pick a random character" button for all modes. UPDATES ON THE NEWS SECTION! Sadly, it seems as though this game was forgotten after the crowdfunding circuit completed. I was tracking this game but ended up getting a copy in the Alpha Fundle Bundle that both our games are featured in (Monsters!). I found it fun and not having played a game like it before, quite entertaining. I've been enjoying a lot of the multiplayer head to head games that have been created recently, like Hokra, Bara Bari Ball, and Tower Fall. I also enjoy the art style. I'm looking forward to see this game finished. I'm probably going to bring it up at our weekly Dev Night get together as a game we should play for "book club" nights. What's the status of the singleplayermode which should be released in March? Because of the lack of a second player I can't really play this game. I'm rewriting the floor generator for having the same level on both players. Also starting testing with the multiplayer.